The very name, Mongolia, conjures up images of wide expanses and far horizons. This sparsely populated nation, historic heartland of Asia's nomadic heritage and the ancient realm of Genghis Khan, is a land of geographic extremes and natural wonders that rival any in the world. Despite Mongolia's natural splendour, and the notoriety of its great empire builder it still remains one of the world’s last frontiers. Relatively few visitors travel beyond the the capital, Ulaan Bataar, and it’s surrounds. In Mongolia’s countryside nomadic herders still tend to their flocks amongst vast grasslands, and ger (traditional ‘tents’ made of felt) remain the accommodation of choice. Travel through a wealth of landscapes, from the sweeping steppes and grasslands of the Mongolian Plateau, to the dense forests and crystalline lakes of the north. Experience Mongolia’s biggest rivers the Orhon and Selenge; Kharkhorin the ancient capital of the Mongol Empire established by Genghis Khan in 1220; mountain passes, and a number of lakes including Mongolia’s largest - Lake Hovsgol, one of the clearest lakes in the world. 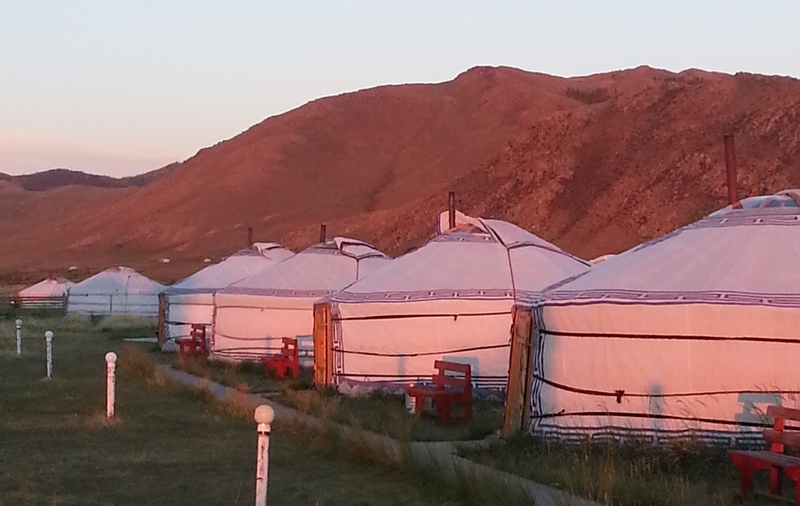 -Personally led by Mike & Angela from Britton Adventures, Mongolian guides and translators. Referred to as UB by locals and expats alike, this chaotic city is home to more Mongolians than the rest of the country, and is the country’s cultural, political, economic and social hub. Full of unattractive concrete buildings, and pot-holed roads jammed with traffic including brand new Hummers and BMW’s. There are pockets of beauty and harmony like the quiet courtyards of the monasteries, large public squares, and the Tuul River to the south. Ulaanbaatar is a capital like no other and a visit there is a unique experience. Known as Terkhin Tsagaan Nuur in Mongolian this serene lake was formed by a lava flow from a volcanic eruption millions of years ago. Located in Arkhangai Province near the town of Tariat this large lake is surrounded by rolling green hills and a smattering of forests. The lakes shores are often home to nomads who set up camp there and graze their herds. There is a volcano, Khorgo, situated near the eastern end of the lake, and the lake is the source of the Suman River. Established in 1220, Kharkhorin was the capital of Mongolia for 140 years and the capital of the Mongol Empire for 32 years, until Chinggis Khan’s grandson, Kublai Khan moved the capital to what is now called Beijing. In 1586 Erdene Zuu monastery was built at Kharkhorin - probably the earliest surviving Buddist monastery in Mongolia. In 1939 the monastery was partially destroyed during Communist driven purge that obliterated hundreds of monasteries and killed over 10,000 monks. After the fall of Communism in 1990 the monastery again became an active place of worship. Lake Hovsgol National Park covers 2.5 million acres and is viewed as the “Crown Jewel” of Mongolia. The deepest lake in Mongolia it contains 70% of their freshwater (1-2% in the entire world), is the largest unpolluted lake in the world, and is headwaters to Lake Baikal (containing 20% of world’s freshwater). It has remained unpolluted because of its remoteness, but this is changing because a sealed road has now been constructed increasing tourism dramatically. Britton Adventures are involved with a project to supply the park Rangers with motorbikes so they can better patrol this hugely significant National Park. This area is known for it’s natural hot springs that flow out of the ground at a relatively high-pressure rate of 10 litres per second. The temperature of the water is 85 degrees Celcius - reputedly the second hottest in Mongolia. With a high mineral content of calcium, sodium and sulphur, the ger camps here (all of which have hot pools) are a drawcard for Mongolian’s who come to the region to soak up the health benefits provided by the hot mineral water. The hot water is more plentiful than cold, so the ger camps use hot to flush the toilets! At 992 kilometres long the Selenge is a major river in Mongolia and Russia. It is formed by the confluence of the Ider and Delger Rivers, and flows into Lake Baikal in Russia. The lower valleys of the Selenge basin are arid and fertile and are used extensively for agriculture, haymaking and livestock grazing. Although it is sometimes used as a ‘Mongolian shortcut’ by city dwellers heading back to Ulaanbaatar after a holiday at Khovsgol lake, it is in fact a longer way but perhaps the Mongolians would rather drive ‘offroad’ through the magnificent countryside than take big, new, sealed highway.